What: A data disc job allows you to create a data disc on a CD, DVD or BDR using files on your hard drive. You can replicate the file structure on your hard drive or you can create your own customized file structure. Recommended for: Use the data disc job to create software installation discs, or data discs containing image files, presentation files, documents or any other file type. This job type is also useful for creating backups of important files on your hard drive. 1. Select Data from the job menu bar. 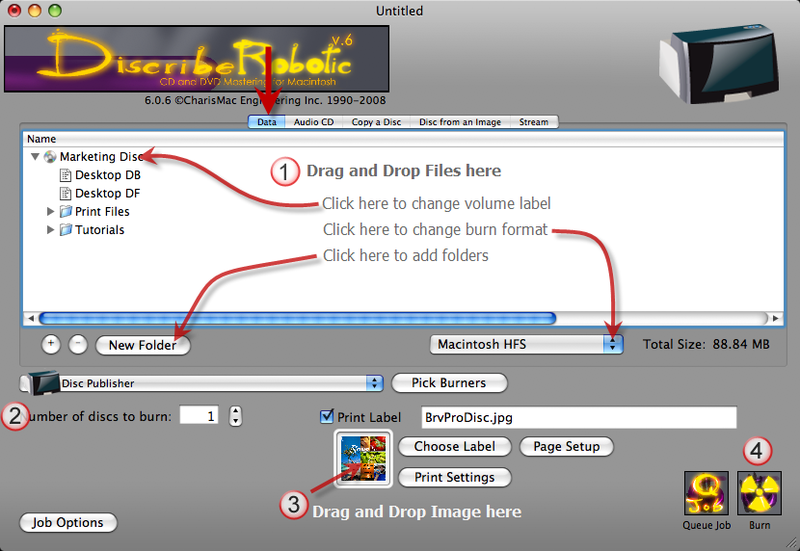 Drag and drop file(s) to the data window to add them to your disc. Click the title next to the disc icon to change the volume label (name of the disc on your desktop when you put it in the Mac). Click the drop down menu to change the data format. Typically Mac HFS is used for CDs that will only be used on a Mac. ISO 9660 could be used for CDs that will be used on both Mac and PC. However, this format limits the file name length of any file to 16 characters. Use (DVD)UDF for DVDs or BDR discs. DVD Video/Audio is used for DVD Videos which is explained in more detail in the DVD Video job instructions. Click New Folder to add folders to your data job that do not exist on your hard drive. 6. To change options such as kiosk mode and burn speed click the Job Options button at any time before starting the job.